Q3 2011 Education Industry Trends - Berkery, Noyes & Co., LLC. The most active acquirer through Q3 2011 was Pearson plc with 6 acquisitions, including Connections Education LLC and Stark Verlag within Q3 2011. The largest transaction for both Q3 2011 and year-to-date was Hellman & Friedman LLC’s announced acquisition of SunGard Higher Education Inc. from SunGard Data Systems Inc. for $1.78 billion. This will result in a merger under a new holding company with Datatel Inc., an existing Hellman & Friedman portfolio company. Total transaction volume in Q3 2011 increased by 12 percent from Q2 2011, from 51 to 57 transactions. Total transaction value in Q3 2011 increased by 241 percent over Q2 2011, from $1.7 billion to $5.8 billion. This was due to five of the top ten largest deals year-to-date occurring in the third quarter. 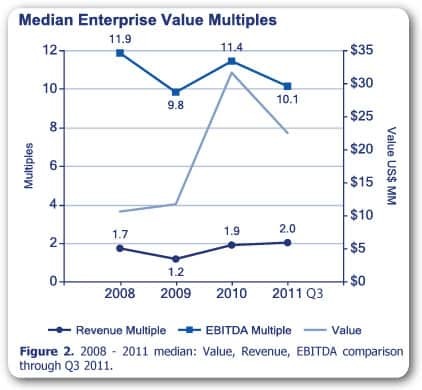 Median EBITDA multiples have decreased 11 percent from 2010 to the first nine months of 2011, from 11.4 to 10.1. Median revenue multiples rose slighlty from 1.9 to 2.0, a 5 percent increase. Providence Equity Partners’ acquisition of Blackboard Inc. for $1.7 billion during Q3 2011, a top ten 2011 deal by value, represents a 3.7 revenue multiple and a 22.3 EBITDA multiple. The top ten deals by value have increased since the half year report, with five new acquisitons in Q3 2011. The two largest were Datatel Inc.’s acquisition of SunGuard Higher Education Inc. (see description above) and Providence Equity Partners Inc.’s acquisition of Blackboard Inc.
Permira’s acquisition of Renaissance Learning, Inc., Pearson plc’s acquisiton of Connections Education LLC, and Devry Inc.’s acquisiton of American University of the Caribbean have also entered into the top ten list of deals. 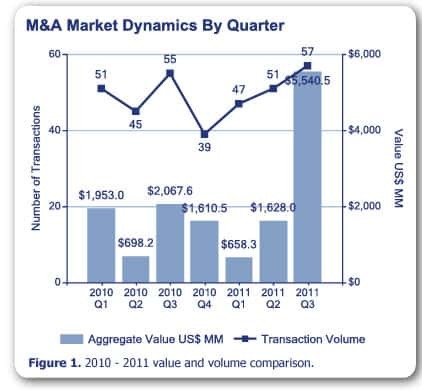 These five Q3 2011 deals, with an aggregate value of $4.5 billion, represent 56 percent of the overall value of transactions in the 1st 3 Quarters of 2011, and 78 percent of Q3 2011 transaction value.